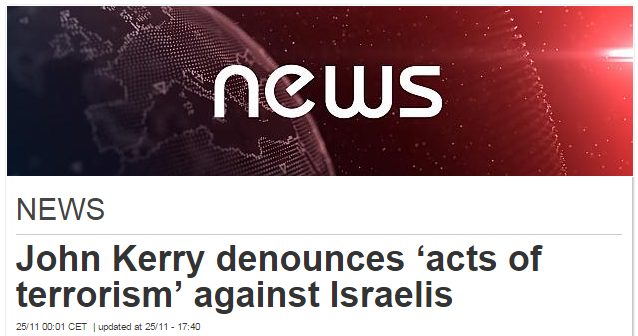 As you can see in the snapshot below, the headline and strap line of a report in the The Telegraph about a recent terror attack in Jerusalem both refer to an “attempted” stabbing. But, as the text makes clear, the teenage Palestinian girl in question did in fact stab and injure a 70-year-old Palestinian man. Indeed, as multiple reports indicate, the stabbing attack was not in question. After complaining to Telegraph editors, they agreed to change the headline and strap line – removing the words “attempted”. Yesterday, we posted about an inaccurate report on the website of Europe’s most watched news channel, EuroNews. 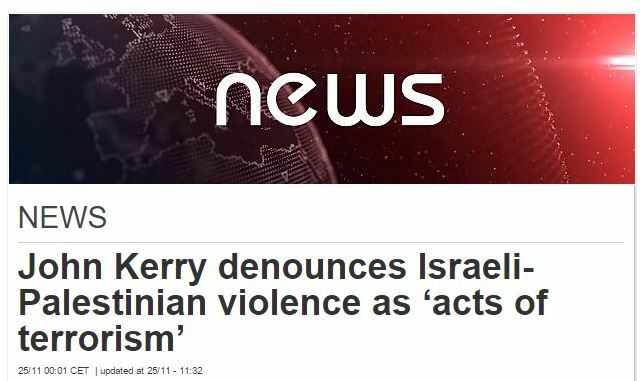 The headline and opening passage both erroneously claimed that US Secretary of State John Kerry condemned “violence between Israelis and Palestinians”, when in fact he specifically condemned Palestinian terror attacks against Israelis. We commend editors at The Telegraph and EuroNews for responding positively to our complaints.